YANGON, Myanmar -- Hundreds of Buddhist monks were on the streets here yesterday helping residents clear roads of fallen trees and other debris caused by killer tropical cyclone Nargis. The gathering of cinnamon-robed monks was one of the largest groups seen in Myanmar's main city since September when they led mass anti-government protests that were violently put down by security forces. “We are now relying on monks to clear this road,” said one middle-aged woman who lived in the neighbourhood here. “Of course we were hoping the authorities would come, but they haven't shown up yet. These monks came after the storm to help the people to clear the streets and to remove the trees,” she said, speaking on condition of anonymity. The streets here are still strewn with hulking trees that were uprooted by the storm and thrown into cars and buildings. Chunks of roofs ripped off homes lie on the pavements, draped by downed power lines. Witnesses have reported seeing few soldiers or police joining the relief effort after the weekend cyclone. “We didn't see any military at all, just police in armoured cars. On Saturday afternoon, we did see some vans, but most of the guys were standing around smoking,” said 32-year-old Pip Paton, who was coming here with her family when the cyclone struck. After the crackdown in September, which the United Nations estimates left at least 31 dead, most monks here fled the city. 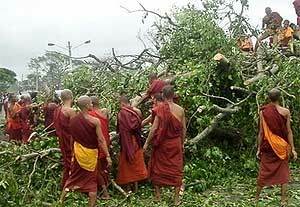 An abbot leading the monks said monasteries in the city had also been damaged in the storm, but that residents had ensured they still had enough to eat. “People are in difficulty, but they are still making offerings to us. Although our monasteries were damaged, so far we have no difficulties for food yet because people are still offering,” he said. Buddhist monks in Myanmar rely on donations from the public for their meals, in an act of alms-giving that earns spiritual “merit” for devotees.